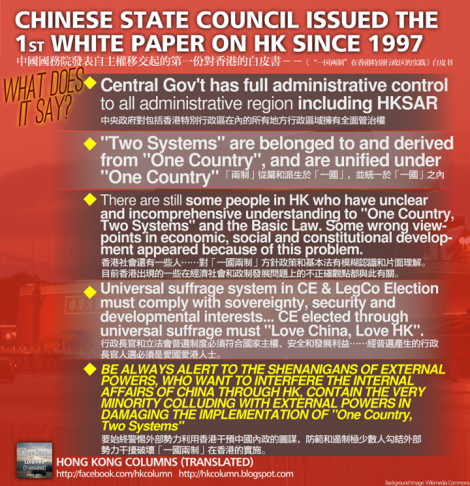 Call for Submissions: "Hong Kong Isn’t Going Anywhere Anytime Soon"
Cha is seeking entries on the theme “Hong Kong Isn’t Going Anywhere Anytime Soon” in response to the Chinese Government’s White Paper (click here for more information) to be included in a special section in the journal. Please send submissions to t@asiancha.com by 30th September with the subject line “White Paper—your name”. Each writer can submit up to two poems. Still they waited and said it wouldn’t be polite. And then their babies’ coughs. As an angry sun told them their day had run. We waited because they said it wouldn’t be polite. due out in September 2014. 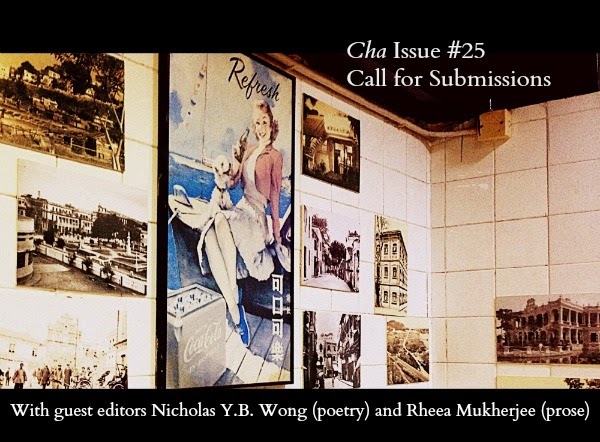 Cha: An Asian Literary Journal is now calling for submissions for Issue #25, scheduled for publication in September 2014. Please send in (preferably Asian-themed) poetry, fiction, creative non-fiction, reviews, photography & art for consideration. Submission guidelines can be found here. Deadline: 15 June, 2014. Nicholas Y.B. Wong (poetry) and Rheea Mukherjee (prose) will act as guest editors and read the submissions with the editors. Please contact Reviews Editor Eddie Tay at eddie@asiancha.com if you want to review a book or have a book reviewed in the journal. We love returning contributors — past contributors are very welcome to send us their new works. In 2013, CCC Press will publish the sixth anthology in its World Englishes Literature series, a book of new short stories in English(es) from Hong Kong. This follows four volumes of African writing, one of which was shortlisted for the 2011 Caine Prize, and a further volume of short stories from Malaysia (forthcoming, 1 May 2012). The Hong Kong anthology will be edited by Xu Xi and Marshall Moore. Contributors should ordinarily be residents of Hong Kong and stories should have Hong Kong or its culture as a theme or setting. The series is designed to represent Anglophone writing in a linguistic context in which English is not the sole or dominant language and to convey a strong sense of place and particular culture. By implication, the volume is not intended as a vehicle for expatriate writers who happen simply to live there temporarily; neither is this a collection of Hong Kong Chinese diaspora writing. However, Hong Kong’s unusual political situation—it has never been an independent nation or city-state—gives rise to an Anglophone writing that departs from the usual colonial and post-colonial literature. Therefore, both expatriate and diaspora authors might, in some instances, render a more persuasive contemporary fiction than a “native” resident. Should you submit, your story must be original and unpublished in any previous form or by any previous means. It should be not more than 8,000 words in length and submitted electronically in MS Word or a compatible format. While we are open to short-shorts or flash fiction, we are unlikely to consider anything less than 1,000 words in length, or a combination of no more than three pieces by one author that comprise at least 1,000 words. It should be adult fiction (in the sense that it is not children’s or YA fiction). It should be written primarily in English and must not be a translation of a previously published work in another language. Writers may submit any number of stories for consideration, although only one story can be accepted for publication. Payment for published stories will be £50 (GBP). If your story is chosen for the publication, we will ask you to provide a few sentences about yourself and your work (around 200 words). Please send submissions by email to Marshall Moore at: marshall (at) typhoon-media (dot) com. SUBMISSIONS should be emailed as a WORD document (.doc) attachment in standard manuscript format, i.e. : double-spaced, 12-point type (serif font like Times or Garamond, no fancy fonts please), with 1” margins on all sides. In the subject line, be sure to type something along the lines of WORLD ENGLISHES ANTHOLOGY SUBMISSION as well as your name. To find out more about the series in which this book will be published, please go to http://www.newventures.net/HTM/Butterfly%20Dreams.htm (includes free previews). Xu Xi’s creative non-fiction was published in issue #6 of Cha. Marshall More’s essay on publishing in Hong Kong was published in issue #15 of Cha. qarrtsiluni is now calling for submissions for its translation-themed issue, due out after the New Year. Cha contributor Nick Admussen is one of the five editors of this edition. The editors invite submissions of poetry, short fiction, essays, visual poetry, photography, artwork and video for a translation-themed issue. The deadline is December 6, and the issue will begin to appear online after the New Year. All submissions must be made via qarrtsiluni’s new submissions manager. In addition to work translated into English, we encourage a universal interpretation, including though not limited to movement between and within cultural fields and from signifier (code, symbol, signal) to signified (message, meaning, transcription). Translation being inherent in all acts of writing/reading, both semantic and non-verbal, we are interested in short, non-academic essays relevant to such readings and mis-readings. Please also send adaptations, definitions, conversions, and homophonic translations. Text submissions should not exceed three poems or short prose pieces, or some combination thereof, for a maximum of three single-spaced pages in .doc or .rtf format. For translations, include originals, permission status, and a bio for the original author as well as your own. Translations from any language are welcome. We look forward to reading or viewing your work. Read more about the translation issue of qarrtsiluni here. Nick Admussen’s translations were published in issue #11 of Cha.